Is mold removal a problem in your Delray home? If you have discovered mold in your house you do not want to put off getting rid of it. Mold can represent a serious health risk and can cause allergy type symptoms or even respiratory problems. In addition to the obvious health issues, the longer you take to deal with mold the bigger the colony will become. Mold removal in Wilton Manors homes and businesses can be tricky at times. When a homeowner or business owner first discovers they have a mold problem, and that's usually only after a moldy smell is detected or people come down with allergy problems or respiratory issues, there is no guarantee that the mold they see is all the mold that there is. Is There Mold in Your Deerfield Beach Home? 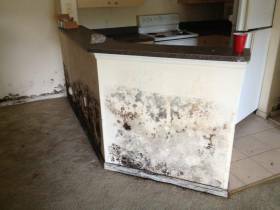 Mold can be found everywhere in Florida including inside your Deerfield Beach home or business. Florida's hot and humid climate makes it ideal for the growth of mold and is home to countless mold species, some are harmless some can cause health problems. Mold removal in a Wellington house can be done by a homeowner if the affected area is small. The Florida Department of Health suggests that you call a professional service like All Florida Restoration if the space is greater than 10 square feet. Mold removal in a Pompano home can be done by the homeowner suggests the Florida Department of health. Of course the FDH is referring to small mold colonies typically effecting less than 10 square feet. More than that and you'll need a professional mold removal service like All Florida Restoration.